SarasotaDog.com welcomes its new contributor, Dr. Sue Nielsen. Sue is a board certified Family Physician with 15 years of experience. While living in Minnesota, she grew a thriving medical practice, held a variety of physician leadership positions, and started a Lifestyle Medicine Program to help people get healthy and lose weight. 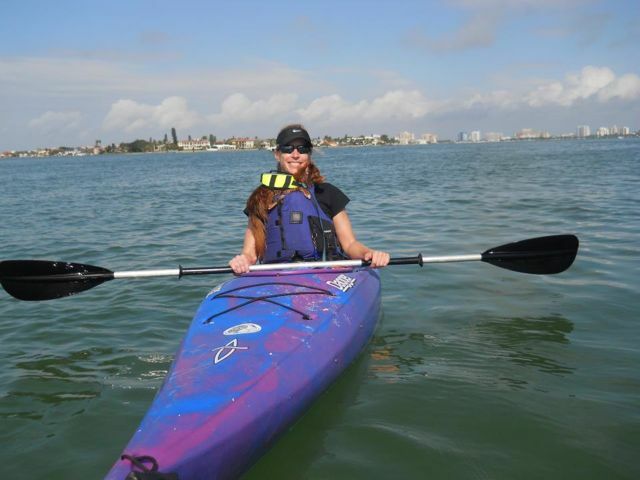 Now in Sarasota Sue has changed the focus of her life toward animal advocacy, outdoor activities, photography, and writing. 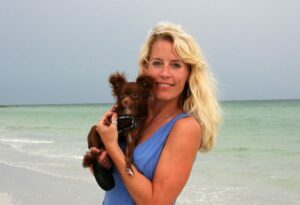 Sue and her trusty companion Rico will be joining us with feature stories on a regular basis. 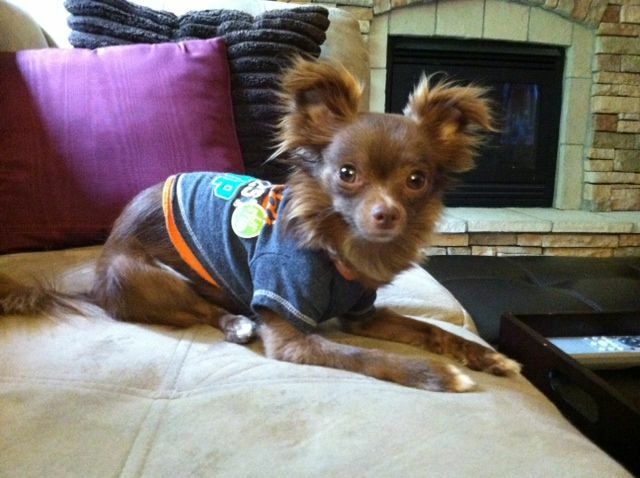 How did a 4 lb dog change the course of an MD? 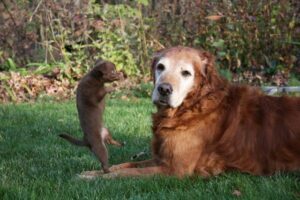 Read Rico and Sue’s story here. Love at first site. Cliché as it is, I have experienced it. Two years ago during a busy clinic, my patient smuggled in two 8 week old Chihuahuas. She had done this before, knowing my love for animals, and hoping I would offer to adopt one. I had always resisted. Thinking in my head, “I don’t want a small dog; it’s not right for me.” This day would be entirely different. The first pup poked her head out of the purse and she was cute of course, but then HE peaked over the edge. Long brown hair, bent ears, white chest and toes, and those warm brown eyes looked directly at me. Oh my gosh! I plucked him up, kissed his forehead, and put him in my lap. He immediately curled up and comfortably snuggled with me for the rest of our appointment. Afterwards, I showed him off to all the staff and took pictures of him. Coming back to my senses, I reluctantly gave him back to her. For the next two weeks I was consumed with thoughts of him. I ruminated over the many reasons not to adopt him. I researched Chihuahuas, talked to my vet, my family and friends. Most agreed that I should not get the puppy. However, after spending a weekend with him “on loan”, and despite waking up every 3 hours to take him to the potty with only a small whimper of warning, I was officially and inextricably in love. Previously unknown maternal instincts to protect and provide for him raged inside me, and I could not move on without him. Someone finally encouraged me to follow my heart and not my head for a change! I didn’t know it at the time, but I would need him far more than he would need me. As a very difficult time unfolded, he provided me with the unconditional love, companionship, support and comical relief that no person could give me. He rescued me and saved me from some very dark places. I can honestly say I may not be here writing this story if not for him. This relationship was completely unexpected. I considered myself a “cat person.” I grew up with a cat. I loved my orange tabby, Hobbes, for 18 years. Cats are very independent which seemed to work for my busy lifestyle of hard work and travel. When Rico came to me, my priorities changed and the course of my life was altered. All decisions now take him into consideration. Like every new mother, I worry excessively when he gets sick or injured. He is shy of four pounds and when he’s playing with big dogs, this triggers anxiety I’ve never felt before! He has congenital liver problems that will shorten his life, but that makes our time together even more valuable. Caring for a small dog has allowed me to bond very deeply. Sleeping beside his little hot body is very comforting. I live in the present moment and forget about my own suffering while walking, playing and cuddling with my Rico. By far, the positives outweigh the negatives, and I’m a better person today because of him. As it is with many dogs, Rico is able to trigger smiles. When he was with me in clinic, the staff would stop by for some therapeutic puppy time. Several patients specifically asked to see him. A few children were calmed by his cuteness and affection. The official regulations did not allow him to be there, but because he helped people deal with the stress of medical clinic, no one complained. (Ah, except maybe that one time he got out of my office and ran all the way across the hospital to find me in the cafeteria. He was SO happy to see me – I was SO surprised he found me!!!) People were sad to see Rico move away. He is still doing his doggie therapy here in Sarasota. When we are on our daily walk, we get stopped by other dog lovers who want to meet Rico. Smiles and laughter abound and my day is so much better because of him. I finally understand the bond between dog and human. Rico is a beloved family member. I want to be with him as much as possible, and it is easy here in Sarasota. I’m so happy to have found many like minded people, dog friendly parks and restaurants, and a rescue community that is vibrant and active. I love exploring new places, kayaking, biking, and Rico comes along a much as possible. I’m going to share our Florida adventures and help you find new ways to enjoy life with your dog. More to come in future stories! Rico really IS a special guy. And his “cuteness” is beyond, beyond. And he is certainly Tiny but Mighty! Nice combo. Congrats, Sue & Rico, for finding each other! Good article! Thank you. I was looking to see if my Mom could see you professionally and stumbled across this wonderful story. You are such a brilliant doctor & I am so glad that you have found a great new adventure with Rico. He is so cute! It is amazing how animals change our lives. I think our kitties prepared us for parenting! I hope that you have many adventures with Rico. He is lucky to have such a loving mommy. Thank you so much for finding me at SarasotaDog! It’s heartwarming to hear from friends back in Minnesota. Hope you are doing well – take care! My wife Gail and I were drawn to Venice because of the dog beach. In the past 4 years we bought several properties in Venice which are currently annual rentals. We are from WI and currently spend 4 months a year here. We love the area. We are continuous users of the Brohard dog beach park. I work the Three Eagle Foundation in northern WI. We raise funds for improving, maintaining, building, promoting a pedestrian/bike trail. It seems everytime we go to the dog beach I wish I could find or form a 5013c non profit that could do the same for the dog park as we do up north for the bike trail. So many people I talk to at the dog beach know its so great and could even be made better. I believe a small amount of creative thinking and some work could reduce the tax load on the city and county for this park. I believe through fund raising, a donation box and some dog owner and dog beach user awareness it would not be long and you could start a have a self sustaining paw park. Think of the alternative a pay to park keosk, yuk! So if you think any of my ideas are worth following up on let’s get together. I’m here to help.